This page presents media reports of the ongoing saga of the Memorial and Historical Building since the vote for its demolition in October of 2013. LITTLE VALLEY — In a Memorial Day ceremony at the Cattaraugus County Memorial and Historical Building, Citizens Advocating Memorial Preservation honored all Civil War soldiers, along with servicemen and servicewomen who made the ultimate sacrifice from the Revolutionary War through present-day conflicts. John Stengel and Gail Bellamy presented a wreath to honor the Civil War soldiers and sailors from Cattaraugus County to which the memorial building was dedicated in 1914. Ray Ball of West Seneca played taps on the bugle. Pastor Dan Butcher from the Little Valley Wesleyan Church led a prayer. Cattaraugus County Legislature Strategic Planning Committee Chairman Matthew Keller (left), C-Olean, and county Public Works Commissioner Joseph Pillittere speak Wednesday outside the Cattaraugus County Civil War Memorial and Historic Building. Committee members and other county officials inspected the monument from outside due to asbestos contamination inside. LITTLE VALLEY — Cattaraugus County lawmakers visited the county Memorial and Historic Building on Wednesday, but could only peek inside due to asbestos-laced plaster from the walls that littered the floor. Accompanying members of the Strategic Planning Committee and other county officials on the visit were representatives from Citizens Advocating Memorial Preservation (C.A.M.P. ), which has been seeking to preserve the building. County Administrator Jack Searles prohibited any entry into the building, or the attached former Board of Elections building, due to the presence of asbestos. “It has delaminated from the walls” due to moisture. It was nearly two years ago the County Legislature’s Public Works Committee agreed to demolish the building and the Board of Elections building after the Board of Elections moved. Interested descendants of members of the 154th Civil War Regiment, made up of men from Cattaraugus and Chautauqua counties, asked the county to delay its demolition to pursue efforts to preserve it. The group of individuals later formed C.A.M.P. After a preliminary look at the Civil War Monument and Historic Building, the committee, other county officials and C.A.M.P. members met in the third-floor committee room of the County Center across Court Street. County officials held a closed-door discussion with County Attorney M. Mark Howden for about 20 minutes before opening it up to the C.A.M.P. members and media. Public Works Commissioner Joseph Pillittere said the building was heated and crews continue to maintain it. C.A.M.P. is “limited in seeking funds for a building it does not own,” Barger said, acknowledging the county does not seem to wish to sell the monument. She said the group recently received 501(c)(3) status to collect tax-deductible donations. She disclosed a man in Minnesota recently sent the group $10,000 after reading about efforts to save the monument. C.A.M.P. Chairman Thomas Stetz proposed the group “sit down with the county and work together to explore all the options” for the building. “We want to help you,” he added. Estimates to restore the building range up to $1 million. Strategic Planning Committee Chairman Matthew Keller, C-Olean, said he didn’t have a lot of information on the Civil War Memorial and Historic Building and welcomed any information C.A.M.P. officials could provide. “That’s what we want — to talk, ” Stetz said. The Cattaraugus County Legislature’s Strategic Planning Committee will tour the county’s Civil War Monument and Historic Building on Wednesday in Little Valley. The committee will review proposed preservation efforts surrounding the building, which had initially been slated for demolition. LITTLE VALLEY — The Cattaraugus County Legislature’s Strategic Planning Committee will tour the county’s Civil War Monument and Historic Building on Wednesday afternoon. Legislator Matthew Keller, C-Olean, new chairman of the Strategic Planning Committee, said the committee has been tasked with coming up with a resolution on the fate of the long-vacant building and the adjacent former Cattaraugus County Board of Elections building. The structure sits at the corner of Seventh and Court streets. Keller said he’s still learning about the issues surrounding the building, which until about 10 years ago housed the Cattaraugus County Museum. “I’ve never walked through there,” he said. Neither have most of the Strategic Planning Committee members. “I’m learning a lot about the building,” Keller added. It was dedicated just over 100 years ago. Now, with little preventative maintenance, it has fallen into disrepair. Paint has peeled from the walls because of high humidity and moisture. It was nearly two years ago that county lawmakers set aside more than $100,000 to remove asbestos from the building and demolish it, along with the former elections board building. A group of local preservationists called Citizens Advocating Memorial Preservation (C.A.M.P.) sought support to delay demolition while seeking funds to preserve the memorial. Many C.A.M.P. members are descendants of the 154th Regiment, made up of residents from Cattaraugus and Chautauqua counties who volunteered to fight in the Civil War. Keller feels the ownership of the building should remain with Cattaraugus County and that a county use for the building should be found. “The Department of Public Works is giving the tour,” Keller said. “The committee will meet afterward across the street” in the third-floor committee room. Portions of the meeting may be held in executive session so members can receive advice from county attorney Mark Howden, Keller said. CAMP President, Tom Stetz (standing), of C.A.M.P. (Citizens Advocating Memorial Preservation), said the group was blindsided by Thursday’s announcement that the Civil War Memorial and Historic Building in Little Valley would be demolished despite C.A.M.P.’s efforts. Posted: Friday, December 4, 2015 10:00 am | Updated: 10:07 am, Fri Dec 4, 2015. LITTLE VALLEY — Members of C.A.M.P. (Citizens Advocating Memorial Preservation) felt blindsided Thursday when they learned the Civil War Monument and Historic Building would be demolished. C.A.M.P. members, led by president Tom Stetz of Allegany, met for what was billed as a work session with the Cattaraugus County Legislature’s Public Works Committee to discuss the group’s preservation efforts. Stetz was notified by email of the work session by Public Works Commissioner Joseph Pillittere, at the direction of Public Works Committee Chairman William Weller, R-Franklinville. County Legislator Richard Lamberson, D-Allegany, a member of the Public Works Committee, read a series of “talking points” that he said represented a consensus of the County Legislature. Lamberson told C.A.M.P. members he had talked to every board member about the issue. The Public Works Committee held an extended closed-door meeting with County Attorney Mark Howden Wednesday, in which the C.A.M.P. efforts were presumably discussed. Lamberson indicated a resolution would be submitted for immediate consideration at Wednesday’s final meeting of 2015 to authorize the building’s demolition. He suggested a study to compare the costs of demolishing the building to the cost of preserving it. The Landmark Society helped C.A.M.P. in its preservation efforts, naming the Civil War Monument and Historic Building to its “Five to Revive” list. The society also paid for half the cost of a study of the building by Clinton Brown, a preservation architectural firm in Buffalo. That study found the building could be put in condition for its reuse for about $580,000. County officials estimated it could cost $1 million to restore the building, which until 10 years ago, housed the county museum. Weller, the committee chairman, said there will be a memorial at the site. Stockman said the decision “is finance-driven. Lamberson said the committee made a mistake by not talking with C.A.M.P. earlier. He said he didn’t think the group would be successful in finding funds to renovate the building. County Administrator Jack Searles said the county had given C.A.M.P. “more time than they requested” to see if they could save the building. LITTLE VALLEY — The Cattaraugus County Legislature’s Public Works Committee will meet in special session Thursday to discuss efforts to preserve the county’s Civil War Monument and Historic Building. At the request of Citizens Advocating Memorial Preservation (C.A.M.P. ), the committee has put on hold county plans to demolish the structure, built in 1913, at Court and Seventh streets in the village. The Public Works Committee, headed by William Weller, R-Franklinville, will meet at 4 p.m. to discuss issues C.A.M.P. representatives have raised over the past several months. C.A.M.P. President Tom Stetz of Allegany said Tuesday the group has been “trying to do the right thing” with respect to the memorial and historic building, which is owned by the county. The Times Herald was unable to reach Weller for comment Tuesday night. The Landmark Society of Western New York has taken an interest in the building, naming it to the society’s “Five to Revive” list and promising C.A.M.P. and the county it would help seek funding for its restoration. The society also contributed to fund a study by a Buffalo preservation firm, Clinton Brown, which said the building is worthy of preservation. “We’re looking for some kind of a commitment from the county not to demolish the building and to join with C.A.M.P. and others to try to preserve it and rehabilitate it,” Stetz said. In addition, C.A.M.P. has asked that the $175,000 the county had set aside to demolish the monument and building, which once housed the Cattaraugus County Museum, and the attached former Cattaraugus County Board of Elections building be set aside toward its restoration. Cattaraugus County Public Works Department officials indicated they planned to do minor work before winter to keep water from getting into the building. Landmark Society of Western New York officials Larry Francer and Caitlin Meives plan to attend Thursday’s meeting to advocate for the preservation of the monument, Stetz said. “We need some kind of a commitment to cooperate with us so we can move forward,” he said. The Memorial thus honored almost 3,500 men who served to preserve the Union. James S. Whipple, the son of a soldier who was captured at Gettysburg and died as a prisoner of war at Andersonville (First Sergeant Henry F. Whipple, 154th New York Volunteer Infantry), opened his main dedicatory address with these words: “One need only to observe the number of people who have assembled here to appreciate the fact that all of you consider this more than an ordinary occasion. The day, the purpose for which you are here should and will be long remembered.” And so Cattaraugus County’s most representative and significant Civil War monument was dedicated. That day, fifty years after they had fought in the Petersburg and Atlanta campaigns, the old soldiers proudly posed for a panoramic photograph in front of the handsome monument that the county had built to commemorate their service. The veterans meant for their Memorial to stand for the ages. Now, a century later, its fate is clouded in uncertainty. For ninety years, the Memorial and Historical Building served its purpose in housing Cattaraugus County’s historical museum, its holdings including a large number of Civil War weapons, uniforms, and relics. But as the decades passed the Memorial suffered from inadequate maintenance. Its distinctive glass dome and neoclassical pediment were removed, together with other decorative flourishes. Museum staffers complained of a leaking roof and of legislators indifferent to the Memorial’s plight. A further indignity came in 2004, when the museum was moved from the Memorial to Machias, a village more than twenty miles distant from Little Valley. The museum’s new home was the Stone House, the former county poor house, which had undergone a $1 million restoration while the county continued to let the Memorial and Historical Building decline. Since the move, the Memorial has sat vacant. The crowning blow came on October 23, 2013, when the county legislature voted to use $125,000 in casino funds to demolish the Memorial and Historical Building and a later attachment, the former Board of Elections building. The day after the vote I received an e-mail from Kyle Stetz, a Cattaraugus County native then living in North Carolina, notifying me of the situation. Kyle was aware of my work as historian of the 154th New York, Cattaraugus County’s most representative Civil War regiment. Eight of the 154th’s ten companies had been raised in Cattaraugus. Many veterans of the regiment – including my great-grandfather, former corporal John Langhans – were present at the dedication of the Memorial and Historical Building in 1914, together with comrades from the 37th and 64th New York Volunteer Infantry, the 9th New York Cavalry, and many other units. I immediately composed a notice about the plan to demolish the Memorial and e-mailed it to hundreds of 154th New York descendants I had linked with over decades of research. I also sent it to the county legislators and the two main county newspapers, and followed it up periodically with other missives. Soon, the county legislators were flooded with e-mails protesting their plan. One legislator later remarked that he had not seen so much mail concerning a single issue in his ten years of serving. The widespread protests gave the county legislators pause. As Kyle Stetz, Nancy Bargar, and I continued to muster opposition to the demolition plan, the legislators put the plan on hold. While still insisting the Memorial must be razed, they put forth a couple of face-saving proposals: to move elements of the Memorial to the Stone House in Machias, or to incorporate them in a new memorial on the Little Valley site. These sops, however, did nothing to appease us opponents of demolition. In the meantime, I wrote to the Rochester-based Landmark Society of Western New York (LSWNY) to apprise them of the situation. Nine days later, on November 19, 2013, LSWNY staffers toured the Memorial accompanied by Nancy Bargar. A subsequent LSWNY memo to the country administrator stated that the Memorial’s condition was not cause for demolition, that it could be economically rehabbed and adapted to a new use. LSWNY staff followed up in a meeting with county administrators and legislators in March 2014. But despite the massive protest by descendants of Cattaraugus County Civil War soldiers and the professional advice of the LSWNY, the county took no action to reverse its course toward demolition, nor did it respond to the LSWNY’s recommendations. The situation settled into a stalemate. In September 2014, one hundred years after the Memorial and Historical Building was dedicated, a letter from Nancy Bargar, Kyle Stetz, and me arguing our case was published in the Olean Times Herald. “It is not merely a building,” it stated of the Memorial, “it is the county’s most significant and distinguished Civil War monument.” Within days, a special legislative subcommittee was named to decide what parts of the Memorial to salvage and display as part of a new Civil War memorial arch above – of all things – a parking lot. A few weeks later, the legislature voted to deny a motion to delay for one month a vote to proceed with asbestos removal prior to demolition. One problem that we fledgling preservationists faced was the fact that many of us were outsiders. I live in Rhode Island, Kyle Stetz had moved to Virginia, Nancy Bargar lives in Cattaraugus’s neighboring Chautauqua County, and most of the protesters who bombarded the county legislature with e-mails live outside of New York State. What we needed was a grass-roots organization dedicated to our goal and centered in Cattaraugus County. That crucial development occurred in November 2014 with the formation of Citizens Advocating Memorial Preservation, or CAMP, chaired by Tom Stetz of Allegany (Kyle’s father). The group’s stated mission was to preserve the Memorial and Historical Building, and to urge its restoration and reuse. In the year since its formation, CAMP has made great strides towards its goal. The group has grown from a handful to about ninety members. It applied for and was awarded a grant from the LSWNY that funded a comprehensive historic preservation plan by Clinton Brown Company Architecture of Buffalo, specialists in the field. The county legislature granted it time to complete and submit the plan. It developed and posted a website (http://cattcomemorial.com/) with links to Facebook and Twitter. The Civil War Trust, the nation’s premier battlefield preservation organization, endorsed it, as did the Cattaraugus County American Legion. It uncovered a set of the original plans for the Memorial by the Jamestown architectural firm of Freeburg and Fidler. It held a moving ceremony at the site on Memorial Day 2015. CAMP has gathered hundreds of signatures on petitions and thousands of dollars in donations in support of its effort. It is taking steps to incorporate as a non-profit to qualify for IRS 501 (c) (3) status. In the meantime, it affiliated with the Cattaraugus Region Community Foundation, which enabled it to receive tax-deductible donations. It continued to spread word of its quest on its website, in newspapers and blog postings, and on the radio. The Clinton Brown Company report was well received by the county legislature (although that body has yet to issue a formal response to it). And around the time of its first anniversary, CAMP members were delighted to learn that the LSWNY included the Memorial and Historical Building on its “Five to Revive” list of “key properties on Western New York that are in need of investment.” Thus the LSWNY will work collaboratively with CAMP and the county to foster rehabilitation and facilitate investment. What will ultimately happen to the Cattaraugus County Memorial and Historical Building is yet to be determined. But at this time, two years after the county voted to demolish it, it appears the venerable Civil War monument has a fighting chance to continue standing for another century and more. 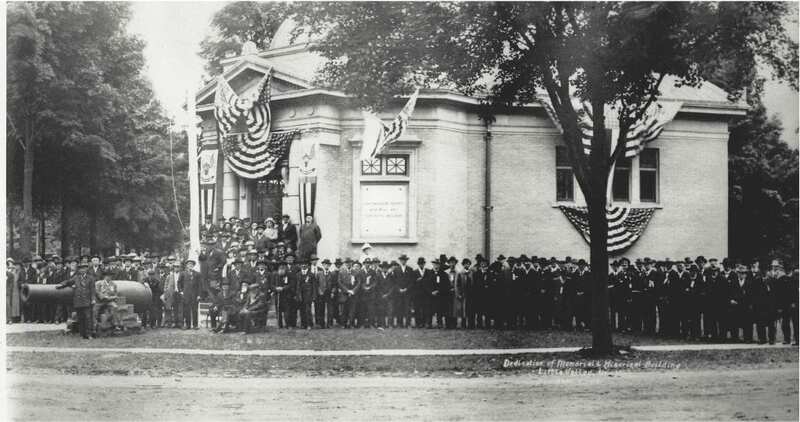 Photos, from above: Veterans at the dedication of the Cattaraugus County Memorial and Historical Building, 1914; A postcard view of the Memorial, date unknown; and the Memorial in the summer of 1993. Photos from the author’s collection. Steve Teeft (left), executive director of the Echoes Through Time museum in Springville and a representative of the Sons of Union Veterans, salutes after placing a wreath near the Cattaraugus County Civil War Memorial and Historic Building in Little Valley. LITTLE VALLEY — For the past year, members of Citizens Advocating Memorial Preservation (C.A.M.P.) have worked to keep the Cattaraugus County Civil War Memorial and Historic Building in Little Valley standing to ensure the memory of area veterans is not lost. That attitude was apparent on Veterans Day, when C.A.M.P. members invited the public to join them for a brief ceremony at the building to honor veterans who have served, who are serving and who have lost their lives. The focus of the ceremony was not solely on the memorial building or its preservation; the 100-year-old structure instead served as a backdrop for its original purpose — to remember and honor the area’s veterans. A group of Civil War re-enactors gathered in front of the building during the ceremony and served as the color guard during recitation of the Pledge of Allegiance. Pastor Nate Lange of the Little Valley Methodist Church read a prayer from a prayer book ratified in the late 18th century. Two wreaths were laid during the event — one by a C.A.M.P. member on the door of the memorial and historic building and a second by Teeft, representing the Sons of Union Veterans from Erie County, near the walkway leading up to it. Later, during an unscripted part of the ceremony, C.A.M.P. Chairman Tom Stetz invited members of the public to come forward and say names of veterans they would like honored at the ceremony. Clark Casler, a Jamestown resident and a descendant of a Civil War veteran, read “Brave Men with Tears,” a poem he wrote about area veterans and the preservation of the memorial and historic building. Stetz, who opened the ceremony by telling the history of Veterans Day, closed with by reading part of a speech given by President John F. Kennedy at Arlington Cemetery on Veterans Day in 1961. Citizens Advocating Memorial Preservation (CAMP) was formed in November 2014 when it became apparent that the Cattaraugus County Memorial and Historical Building located in Little Valley, a memorial dedicated in 1914 to the county’s Civil War veterans, was in danger of being demolished. Since that time, CAMP, an organization of history-minded residents, has made progress toward the preservation of the memorial. However, much work remains to be done to secure its preservation and rehabilitation. On Oct. 10, CAMP sent a letter to all 27 Cattaraugus County legislative candidates in Tuesday’s election to determine their individual positions regarding the preservation of the Memorial Building. The letter, which included three short “yes” or “no” statements, also allowed the candidates to make additional comments if they desired. To see the complete letter, list of candidates and their responses, go to cattcomemorial.com and click the blog tab to view them. From the 27 candidates sent letters, only nine responded. All but one indicated that they were willing to work for the memorial’s preservation. CAMP understands that not all candidates will totally agree with our preservation efforts, but what we do not understand is the lack of response from some candidates. CAMP urges all Cattaraugus County voters to read the comments made by those candidates who responded to our letter by viewing them on our website. We also urge you to remember those candidates who did not respond to an issue that is a concern to many residents when you cast your vote on Tuesday. Proponents of preserving the Cattaraugus County Civil War Memorial and Historic Building in Little Valley received good news Monday when the Landmark Society of Western New York included the building on its “Five to Revive” list. The announcement was made at the Landmark Society headquarters in Rochester; the list includes four other historic sites in Rochester the group has identified as opportunities for targeted, strategic revitalization. Tom Stetz, president of Citizens Advocating Monument Preservation (C.A.M.P. ), attended the ceremony where the Cattaraugus County-owned Civil War monument was announced for the list. He was not available to comment Monday. “Each year, these five properties become priority projects for Landmark Society staff and programs as we work collaboratively with owners, municipal officials and developers to facilitate investment and foster rehabilitation,” Goodman said. The ultimate goal is to return these important historic resources to a place of prominence in their respective communities, as economic and social assets that spark even more investment and revitalization. The memorial and historical building were built in 1911. 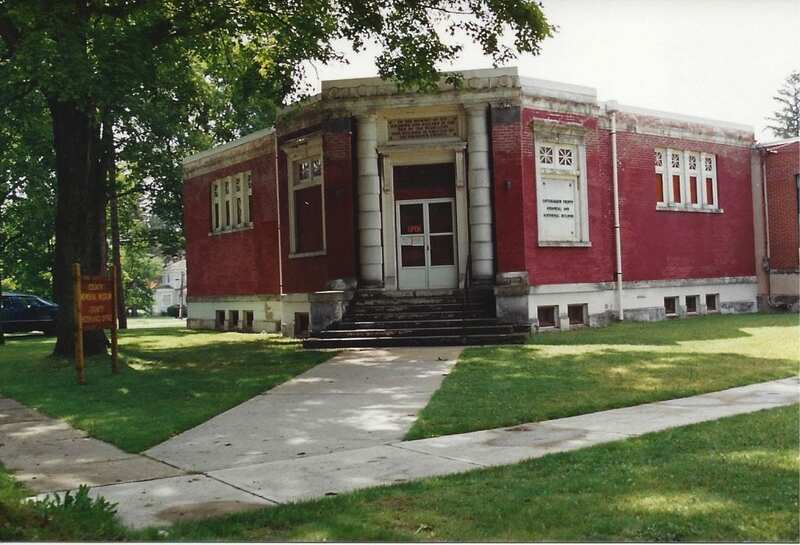 Adjacent to Route 353 and the Cattaraugus County Building, the historical structure once housed a library and, until 2004, the county museum. In 2014, county officials announced plans for its demolition. C.A.M.P. — formed to promote the rehabilitation of the iconic building — is working with local officials, community residents and preservation organizations. “A highly visible landmark for over 100 years, the memorial building has excellent potential for rehabilitation and reuse as a community resource in the 21st century,” Goodman said. Imagine how they must have felt, the men of the 154th New York Infantry, as they waited in Elmira for the train to take them on the last leg of their journey home. Cattaraugus and Chautauqua counties lay just hours to the west. They had marched through Virginia, Maryland and Pennsylvania. They had fought their way from Chattanooga, Tenn., to Atlanta, Ga., and from there, marched to the sea. Then they marched again through the Carolinas and, in victory, they passed in grand review through Washington. The men of 154th would remember their commander’s plea when, on the eve of another great war, they erected a memorial to those comrades who had fallen 50 years earlier. Dedicated in 1914, the Cattaraugus County Memorial and Historical Building – erected in Little Valley – honored all soldiers and sailors from the county who had served during the Civil War. Last October, the County Legislature voted to demolish the memorial, which had fallen into disrepair and disgrace after years of neglect. Since then, 12 months of dithering have done little to decide the building’s fate. In 1862, the men of Cattaraugus County didn’t have the luxury to “study” the rebellion. They knew their duty, and acted decisively. Local preservationists have worked hard to remind county legislators about the service of those men and the duty they performed that made everything today possible. Legislators, in turn, have a duty of their own: to remember the debt we owe those who came before. Chris Mackowski, Ph.D., is Professor of Journalism and Mass Communication at St. Bonaventure University. LITTLE VALLEY — A preservation plan for the Cattaraugus County Memorial and Historical Building picked up support among county lawmakers Wednesday. The report on the Little Valley Civil War Monument and Historical Building by Clinton Brown Co. Architecture of Buffalo was sponsored by C.A.M.P. (Citizens Advocating Memorial Preservation), and the Landmark Society of Western New York. “The building is in good condition and is rehabilitatable and reusable at a reasonable cost,” said architect Clinton Brown. It is missing a purpose, which should be a community consensus, he told members of the County Legislature’s Public Works Committee. The building was dedicated 101 years ago as a memorial to those county residents who fought and died in the Civil War, many of whom were members of the 154th Hardtack Regiment. Brown, an architect who has worked on historical projects for 27 years, said the first thing to do is prevent any more water infiltration by replacing the roof and drainage systems. The county could help out by allocating the $150,000 it budgeted for the building’s demolition for a new roof, Brown said. There is some discussion whether it could be accomplished this fall. C.A.M.P. President Tom Stetz of Allegany explained the support the group received, including thousands of signatures, letters of support, help from the Landmark Society of Western New York and possible financial help from the Civil War Trust. The Civil War monument’s future looks much brighter than it did a year when county lawmakers were looking to demolish it and the adjacent former Board of Elections building after the Board of Elections vacated the building. The Civil War building has gone unused for the past 10 years since the County Museum was moved to the Stone House in Machias. Brown complimented county officials on the overall condition of the building. One estimate of the cost to renovate the interior was between $500,000 and $570,000, which could come from sources outside the county. Larry Francer, associate director of the Landmark Society of Western New York, dispelled an important issue county lawmakers had been concerned about: a reverter clause in the deed of selling the land to the county for a courthouse and jail. Since the land was used for a courthouse and jail, the reverter clause cannot be invoked even if the descendants could be located. The Landmark Society is willing to take a purchase option on the property while attempting to try to not only find a way to preserve it, but find a new use for the building, Francer said. The building is being considered for the Landmark Society’s Five to Revive project, which could open up other funding opportunities, he said. “I hope you agree not to demolish it and help find a new use for this building,” he said. 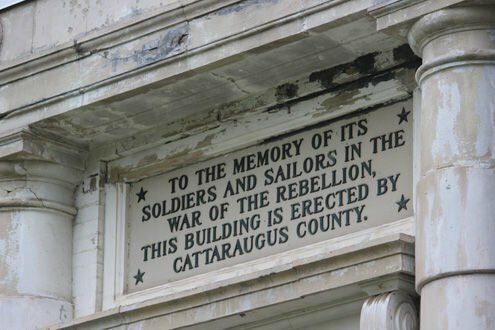 The Cattaraugus County American Legion recently voiced its support for the building’s preservation as a monument to Civil War veterans. Public Works Committee Chairman William Weller, R-Franklinville, who initially favored demolition of the Civil War Monument and Historical Building while preserving some of its elements, said he has changed his mind and is willing to give C.A.M.P. time to save the monument. LITTLE VALLEY — The Cattaraugus County Legislature’s Public Works Committee will hear a presentation Wednesday from Citizens Advocating Memorial Preservation (C.A.M.P.). The group, headed by Tom Stetz of Allegany, is seeking to convince the Legislature that the county’s Civil War Memorial and Historic Building on Court Street deserve to be preserved. The Legislature last year allocated $150,000 to remove asbestos from the building and demolish it along with the adjacent former Cattaraugus County Board of Elections office. However, when C.A.M.P. — made up largely of descendants of the 154th Hardtack Regiment of soldiers from Cattaraugus County who fought in the Civil War — expressed interest in saving the building, county lawmakers agreed to give them time to come up with a plan. Part of that plan will be described to county lawmakers Wednesday when Stetz outlines a report from Clinton Brown Co. Architecture, Buffalo, made possible by a grant from the Landmark Society of Western New York. It describes preservation options and recommendations. The recommendations could include stabilizing the building and mothballing it until potential funding sources and uses are identified. The 101-year-old building was used for the Cattaraugus County Museum until about 10 years ago when it was moved to the Stone House in Machias. John Sampson of the Cattaraugus County American Legion speaks to county lawmakers Wednesday to explain the Legion’s support for preserving the county’s Civil War Monument and Historic Building in Little Valley. The 100-year-old building was slated for demolition, but legislators agreed to give Citizens Advocating Memorial Preservation (CAMP) time to come up with a plan to preserve the structure. LITTLE VALLEY — Citizens Advocating Memorial Preservation (C.A.M.P.) got some needed public support Wednesday for its efforts to save the Cattaraugus County Civil War Monument and Historic Building in Little Valley. A resolution approved earlier this summer by the Cattaraugus County American Legion Convention in Hinsdale to support C.A.M.P.’s efforts to preserve the monument and building on Court Street was read to county lawmakers at their meeting. American Legion spokesman John Sampson said Legion Commander George Filgrove could not attend and asked him to read a short letter to the Cattaraugus County Legislature regarding the future of the monument, dedicated in 1913. The distinctive brick building has sat unused for more than a decade since the Cattaraugus County Museum it housed was moved to the Stone House in Machias. Legion members in Cattaraugus County are dedicated to preserving the history and sacrifices of those citizens, Sampson said. C.A.M.P. officials are reviewing a report on the building made possible by a grant from the Western New York Landmark Society. It includes cost estimates for building preservation efforts and possible uses. Legislature officials have put asbestos removal and demolition plans on hold while awaiting word from C.A.M.P. on preservation efforts. LITTLE VALLEY — Citizens Advocating Memorial Preservation (C.A.M.P.) officials spoke to hundreds of people at last week’s Cattaraugus County Fair who favored preserving the county’s Civil War monument and memorial. C.A.M.P. President Tom Stetz of Allegany said Monday that more than 600 signatures were obtained on a petition to the Cattaraugus County Legislature to preserve the 100-year-old monument. The monument, located across from the Cattaraugus County Center on Court Street, has fallen into disrepair. Out of all the people that came by, only a handful didn’t want to talk about it, he noted. “The two most asked questions were, ‘Why do they want to tear it down?’ and, ‘What do you think of the Confederate flag?’” Stetz said. C.A.M.P. officials are waiting for the final draft of a preservation study made possible by the Landmark Society of Western New York, Stetz said. “We want to meet soon and decide how we’re going to release it to the public and press,” he explained. “I’d prefer not to say any more about it right now. C.A.M.P. was told the final draft of the preservation has been held up while the Preservation Society deals with plans by Chautauqua Institution officials to demolish its historic Amphitheater in Chautauqua County and rebuild it, Stetz said. County officials have put on hold plans for the removal of asbestos and the demolition of the building, which has not been used in more than 10 years. It was formerly used for the Cattaraugus County Museum. The attached former board of elections building — unused for nearly two years — has also been targeted for demolition. C.A.M.P. officials were also heartened by the support of the preservation project by the Cattaraugus County American Legion at its convention in June, Stetz said. Legion officials said they planned to deliver it to the Legislature as evidence of their support. Civil War re-enactors including Edward Stengel of Cuba (on stairs) give a Memorial Day presentation by Citizens Advocating Memorial Preservation on Monday outside the Cattaraugus County Monument and Historic Building in Little Valley. LITTLE VALLEY — The outside of the Cattaraugus County Monument and Historic Building on Court Street was abuzz with activity Monday as preservationists held a memorial ceremony to Civil War veterans and the nation’s other war dead. “It went great,” Thomas Stetz, president of Citizens Advocating Memorial Preservation (C.A.M.P. ), said the day after the ceremony that followed Little Valley’s Memorial Day parade. “We had a pretty good crowd of 50 or 60 people who came after the Little Valley parade,” said Stetz, who gave opening remarks, thanking those attending. He then asked for everyone to honor all veterans with a moment of silence. Stetz then invited anyone in the audience who wished to share their thoughts about veterans from other than the Civil War. A few of the participants did get up and speak about their relatives’ military service. After leading those assembled outside the 100-plus-year-old building, a Little Valley Cub Scout, Noah Fuller, presented the flag to a group of several Civil War re-enactors led by John Stengel of Cuba. Stengel portrayed a veteran who returned from the Civil War and attended the 2013 dedication of the monument and building. Descendants of members of the 154th Regiment, which included many Cattaraugus County residents, read statements about their ancestors who fought in the Civil War. A U.S. Air Force major who spoke earlier at the Little Valley Memorial Day ceremony at Little Valley Rural Cemetery also attended the C.A.M.P. service, Stetz said. After speaking briefly about modern-day veterans, the major related an interesting Civil War story involving a father and son killed on the same day in the same battle. C.A.M.P. officials then placed a monument in front of the monument, knowing it could be the last such ceremony. Stetz spoke briefly about the building still being in jeopardy of being demolished. “We’re trying to preserve it so that it stands forever in peoples’ memories,” he said. Also speaking was Cattaraugus County Legislator Carl Edwards of Limestone, who urged his colleagues to give C.A.M.P. enough time to study the building and raise funds to help preserve it. County lawmakers had expected to demolish the building after setting aside funds to remove asbestos and demolish it along with the adjacent former Cattaraugus County Board of Elections building. Legislators last year agreed to give C.A.M.P. time to see what they could do to preserve it. The Public Works Committee is looking for some progress by this fall before considering another time extension. “We’ve got a preliminary report we’re looking over right now,” Stetz said. The $3,500 report by Clinton Brown Co. Architecture of Buffalo was paid for using a $2,500 grant from the Landmark Society of Western New York, which has deemed the building worthy of preservation. That is not only expected to tell C.A.M.P. if it can be preserved and for how much, but also offer some proposed long-term uses for the building. LITTLE VALLEY — Citizens Advocating Memorial Preservation (C.A.M.P.) will hold a Memorial Day ceremony on Monday at the Cattaraugus County Memorial and Historical Building, located at the corner of Court and Seventh streets. The brief ceremony will start at 11:30 a.m., following the Little Valley Memorial Day parade and cemetery ceremonies. Appropriate Memorial Day speeches and comments will be made, with Civil War re-enactors serving as an honor guard. A wreath will be placed at the memorial to honor the Civil War soldiers and sailors from Cattaraugus County to whom the memorial building was dedicated in 1914. The public is invited to join C.A.M.P. at this ceremony to honor the memory of the 3,500 Cattaraugus County Civil War veterans who fought in the “War Of The Rebellion” to preserve the Union. For additional information, visit the C.A.M.P. website at www.cattcomemorial.com. LITTLE VALLEY — Cattaraugus County lawmakers voted Wednesday to use $125,000 in casino revenue to demolish the former County Board of Elections and County Museum buildings across from the County Center on Court Street. Added to $50,000, which is already in an account for the demolition, county officials expect to have enough to hire an engineer to determine the extent of asbestos in the two buildings, then hire a certified contractor to remove the asbestos and complete demolition. The Board of Elections earlier this month completed a move to renovated space in the former Cattaraugus-Little Valley Elementary Campus on Rock City Street in Little Valley. The former County Museum which is right next door, has been vacant since the museum moved to the Stone House in Machias more than five years ago. “Will the $175,000 be enough to do the entire (demolition) project?” asked Legislature Vice Chairman James J. Snyder, R-Olean, who is Finance Committee chairman. LITTLE VALLEY — Last week, Cattaraugus County lawmakers voted unanimously to use $125,000 in casino funds to demolish the former county Board of Elections and County Museum buildings on Court Street in Little Valley. On Friday, Mark Dunkleman, as Civil War author and the descendant of a Civil War solider in the 154th New York Regiment from Cattaraugus County, sent an email to county legislators urging them to reconsider plans to demolish the old County Museum, which is adjacent to the former Board of Elections building and shares a common wall. “My hope is that the legislators will reconsider their decision to destroy what is not just an old building that used to house a museum, but Cattaraugus County’s most significant Civil War memorial,” Mr. Dunkleman told the Times Herald. Two weeks ago, the Cattaraugus County Legislature voted unanimously to use $125,000 in casino funding, plus $50,000 the county has on hand, for demolition of the former Board of Elections building and the attached former Cattaraugus County Museum that dates back to 1911. LITTLE VALLEY — Cattaraugus County lawmakers scrambled Wednesday for details on the proposed demolition of a building some consider a Civil War memorial worthy of preserving. Two weeks ago, the Cattaraugus County Legislature voted unanimously to use $125,000 in casino funding, plus $50,000 the county has on hand for demolition of the former Board of Elections building and the attached former Cattaraugus County Museum that dates back to 1911. Then came the emails and letter to the editor from descendants of the 154th Regiment, which included Cattaraugus County and Chautauqua County residents who fought in the Civil War. The descendants were upset over the plans to demolish the memorial. Legislator Linda Edstrom, R-Olean, a Public Works Committee member, said she replied to those sending emails regarding the former museum that she would get answers to their questions. Joseph Snyder, R-Ischua, another Public Works Committee member, said the county should photograph the buildings’ problems and send them to those expressing their concerns. “If they are that passionate, let them raise $1 million” to fix it, he said. Public Works Committee Chairman William Aiello, R-Olean, said he thought a memorial should be placed on the site after the demolition. Some of the buildings’ architecture would be transferred to the new museum at the Stone House in Machias, he explained. Mr. Aiello suggested perhaps the memorial itself could be placed at the Stone House in Machias. Several architectural items are destined for saving, he said. Another Olean legislator, Steven Teachman, said the museum was moved to the Stone House in Machias because of long-standing water problems at the museum that threatened its collections. Legislator Donna Vickman, R-Farmersville, said she hoped some of the elements of the old museum could be saved at the new museum in Machias, as Civil War events are often staged there. LITTLE VALLEY — Cattaraugus County lawmakers, stung by criticism of plans to demolish the former Board of Elections and County Museum buildings, may be about to put those plans on hold to look at other options. Legislator Steven Teachman, R-Olean, a Civil War re-enactor and history enthusiast, has prefiled a resolution for committee consideration Wednesday calling on fellow legislators to give the buildings a temporary reprieve. LITTLE VALLEY — A resolution seeking to temporarily set aside plans to demolish the former Cattaraugus County Museum and Board of Elections buildings was put on hold in the County Legislature’s Public Works Committee Wednesday. Over the past several weeks, county lawmakers have been inundated by email from descendants of the 154th Regiment of Civil War volunteers from Cattaraugus and Chautauqua counties opposed to the county’s plan to demolish what is considered a Civil War monument. Olean Legislator Steven Teachman, a history buff and Civil War re-enactor, submitted the resolution to hold up the engineering study, asbestos abatement and demolition of the two buildings across from the County Center on Court Street. County Attorney Thomas Brady said the county was prohibited from selling the building to private interests even if they planned to preserve it due to a covenant in the deed of the property to the county. “You can’t sell it because it is on county property,” Mr. Brady said of the former County Museum that adjoins the recently vacated Board of Elections building. That would violate a restrictive covenant and the entire property including the County Center and County Jail could revert back to the family that deeded it to the county, Mr. Brady explained. Linda Edstrom, R-Olean, a member of the Public Works Committee, said the emails she’s been getting from 154th Regiment descendents haven’t addressed what to do with the building. “They just don’t want it demolished,” she said. Legislators unanimously voted last month to use $125,000 in casino money to add to $50,000 already in hand for the demolition of the Board of Elections/County Museum. Mr. Teachman said his resolution was designed to signal the opponents that “we want to work with them,” particularly if any parts of the building are to be saved in the event the building cannot be saved. Mark Burr, Public Works director of engineering, said the roof leaks and the masonry building has no moisture membrane. The brick wall holds water like a sponge and is not Americans With Disabilities Act (ADA) accessible. Public Works Committee Chairman William Aiello, R-Olean, said the state has said that with changes to the original building constructed in 1911, it is no longer has any historical significance. Committee members agreed to put a temporary hold on the demolition until further consultation with descendents of the 154th New York Regiment. 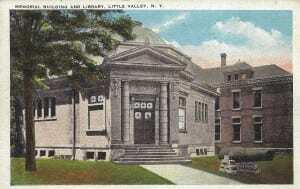 There has been much discussion recently regarding the building in Little Valley that once housed the County Museum. Let me review some of the available information regarding this building. The original “seed” funds for this building was about $500 left over from the Cattaraugus County Centennial of 1908. Local Veterans groups indicated they wanted to use this money to build a veterans memorial in Little Valley. Veterans groups agreed to raise the money for this facility. After a number of years such groups were not able to raise the full amount of money needed. As time went on the veteran’s population of the county began to question whether a building or memorial should be built. Cattaraugus County provided the funding needed to complete the project. On December 6, 1911, the Cattaraugus County Board of Supervisors authorized $10,000 of County monies to complete this project by a vote of 28 (ayes) to 3 (noes). The octagon shaped building was dedicated in 1914 with a large glass dome and an elaborate facade. By 1922, the dome was removed because it was leaking. Sometime during this period the original façade of the building was also removed. In the 1940’s, the windows on the building were covered because the sunlight was destroying artifacts housed in the building. Sometime around this time another building was added onto the original building. This is a 1 story building and the utilities for this building are located in the adjacent Museum Building. The new structure is three sided, sharing a wall with the then Museum Building. As time would tell, this building was not built especially well, by today’s standards. This new building would eventually become the Board of Elections. In June, 1970 a three-ply smooth build up roof was applied over the existing roof to address leaks. During the roof application existing copper edges were straightened, where necessary, and new roofing installed to the copper edge. Additionally, three breather vents were installed in the roof. The condition of this building as well as existing water leakage issues with the Museum Building has promoted a series of repeated and ongoing efforts to fix these leaks. Ventilation issues have also been problematic over time. Most recently were those efforts done in 1981, 1988, 1997 and 2009. Again, this moist atmosphere in the Museum building was deteriorating some of the collections maintained by the Museum. Throughout this period there have been repeated problems with water related damage. On more than one occasion, black mold has been found and cleaned up in the old museum. Both buildings, in general, are very moist which contributes to mold growth. Further, when the Museum Building was built there were not the concerns we now have with asbestos. There is asbestos throughout at least the basement area of this building. In 2004, the County bonded to provide funds to demolish both buildings. Demolition was not completed at that time. Starting on September 20, 2004, the Museum operation was moved to the oldest County Building, that of the Stone House in Machias, which was renovated at a cost of over a $1 million. This is where the County Museum is currently located. This move allowed the Museum to have access to areas better suited to maintaining their collections, updated and larger spaces. In 1988 Habitera Associates completed a space study that listed the Museum in Little Valley as having 1,000 square feet of exhibit area, 400 square feet of general office space and 200 square feet of work room. The office and work room space were used as the genealogy and historical research area. The total usable, excluding the basement was 1,600 square feet. The basement area, not accessible to the public, was listed as 1,300 square feet. The current Museum in Machias has 2,100 square feet for exhibits, 714 square feet in the lobby/entry area, 400 square feet in the archives room and 1,000 square feet in the research/office/additional archives room. All of these areas are on the first floor plus there is a handicapped accessible bathroom. Additional storage is available in the basement of this building. When the Museum moved from Little Valley to Machias, the Mueseum’s Board of directors authorized the Historian/Museum Curator to place on eBay certain items that were not deemed to be directly part of Cattaraugus County’s story of its people and history. This was approved through the Legislature and each item was reviewed by the museum board members. It was felt that even though all history is significant, we wanted to use our resources to highlight and research the County’s population and life experiences. In the end little was sold and the profit barely covered the expenses associated with the sales. Several efforts were evaluated to look at alternate spaces for the Cattaraugus County Board of Elections. This office, by State Law must be located within the geographic boundary of the County Seat. After several unsuccessful prospects were explored, it was decided that the Board of Elections would move into newly renovated space in the Little Valley School Building. This move occurred in September-October, 2013. Currently, the Old Museum Building and the attached Board of Elections Building are vacant. Much has changed since the corner stone was laid on the Old Museum Building. The building is now functionally obsolete, it does not meet current standards (like the Americans with Disabilities Act and NYS Building Codes), it continues to be damp, and it has been repeatedly modified over time. Prior to formally moving forward with the proposed demolition, we reached out to the New York State Office of Parks, Recreation and Historic Preservation (OPRHP) for their review and opinion on this matter. In a letter dated June 10, 2013 from the OPRHP, Ruth L. Pierpoint, the Deputy Commissioner for Historic Preservation notes “based upon this review, it is the OPRHP’s opinion that your project will have No Impact upon cultural resources in or eligible for inclusion in the State and National Register of Historic Places”. The land on which these buildings are located is on a parcel deeded to the County for specific purposes. In large measure, the physical location of these buildings on this original parcel, are in a park, owned and maintained by the County with at least one memorial area already designated. Currently, there are no plans to use this space, once the buildings are demolished, for anything but park land. This and future decisions regarding the use of this land, however, remains with the governing Board of the County, the County Legislature. Hearing and acknowledging the input from various decedents of Civil War Veterans, most from out of state, the County is carefully evaluating whether some of the existing design elements can be incorporated into a new memorial, become part of the Museum collections and/or be reused as component parts of new construction efforts in the future. These options are currently being explored. Below are pictures of some of the items referenced above. Attached is a copy of a photograph showing the structure of the building on the day of dedication. Attached also is a picture of how the building looks today. Also attached are pictures from the interior of this building. Finally, I am including a copy of the letter from OPRHP referenced above. LITTLE VALLEY — One hundred years ago this month, more than 200 Civil War veterans gathered in Little Valley to dedicate the Cattaraugus County Memorial and Historical Building. Last year, the Cattaraugus County Legislature voted to demolish the former Cattaraugus County Museum on Court Street, across from the County Center, when the adjoining Board of Elections building was vacated after the office was moved to a new location. After the firestorm of criticism from preservationists, including descendants of the 154th Regiment of Civil War soldiers from Cattaraugus County, the Public Works Committee decided to temporarily suspend demolition efforts while working with those who sought to save the historic building. The museum moved 10 years ago to the Stone House in Machias. The former museum has stood vacant since then. Mark Dunkleman, a descendant of a 154th Regiment soldier and a supporter of keeping the building, emailed supporters this week asking them to contact Public Works Committee members to work with preservationists to save the historic building. The Landmark Society of Western New York (LSWNY) toured the Memorial and Historical Building in November 2013 and, in a memo to County Administrator Jack Searles, stated the building was in relatively good condition, it could be economically rehabilitated for a new use and it was an excellent candidate for listing on the National Register of Historic Places. The group met with Mr. Searles and Public Works Committee members in March and “discussed ways the LSWNY could help to facilitate the preservation and reuse of the Memorial and Historic Building,” Mr. Dunkleman wrote. “Since that meeting, the LSWNY has received no response to its proposals from county officials,” Mr. Dunkleman added. He asked supporters to email Public Works Committee members to explore alternatives to demolition. “As county residents, your voices will resonate the loudest,” he said. Public Works Committee Chairman William Weller, R-Franklinville, said the Legislature hasn’t made a final determination on the building yet. “We do need to move forward on this and decide what to do,” he said. The legislature has set aside $175,000 for asbestos removal and demolition of the former museum and Board of Elections buildings. Mr. Weller said he favors leaving at least a portion of the building as a memorial. Public Works Committee member Steven Teachman, R-Olean, a Civil War buff and collector, said he was not aware of Mr. Dunkleman’s latest efforts to save the structure. Mr. Teachman said estimates to preserve and rehabilitate the building are in the $1 million range. “The Legislature really doesn’t have any desire to save this building,” he added. The Cattaraugus County Civil War Monument, the former Cattaraugus County Museum in Little Valley, appears to be once again headed for the wrecker’s ball as county lawmakers look to salvage parts for a new memorial. It could become an expanded parking lot across from the Cattaraugus County Center. LITTLE VALLEY — A special Cattaraugus County Legislature subcommittee was named Wednesday to help decide what parts of the county’s Civil War Monument to salvage and display as part of a new Civil War memorial. The action by Public Works Committee Chairman William Weller, R-Franklinville, was sparked by several emails to county lawmakers by supporters of those involved in preserving the former Cattaraugus County Museum across from the Cattaraugus County Center. Mr. Weller named Steven Teachman, R-Olean, as chairman of the subcommittee. Other members are Linda Edstrom, R-Olean; Legislature Chairman Norman Marsh, R-Little Valley, and county Administrator Jack Searles. Mr. Teachman, a Civil War enthusiast, has proposed demolishing the structure and the adjoining former Board of Elections building, while building a Civil War monument using parts of the old museum. The Legislature has voted to spend up to $175,000 for asbestos removal and to demolish the buildings, which share a common wall. Ms. Edstrom said she thought the decision had been made to save some portions and make a memorial then demolish the building, dedicated 100 years ago to Civil War soldiers. “We want to do something to preserve what was done by the Civil War soldiers,” she said. Legislator Susan Labuhn, D-Salamanca, asked what would be erected in its place. Mr. Teachman said significant parts of the building like the columns should be saved. He has proposed an arch above a parking lot on the site to be dedicated to the Civil War dead and plans to consult with Crandall’s Memorials regarding a memorial. Mr. Searles asked whether a less expensive method of asbestos removal should be done prior to demolition. Mr. Teachman said proposals by the Landmark Society of Western New York, which toured the building last fall and declared it worthy of preservation, failed to come up with any alternatives. “They presented some … but none of them were feasible,” he said. County officials have said it would cost up to $1 million to preserve and eventually reuse the building. County Attorney Thomas Brady said a restrictive covenant in the deed to the property cannot be removed without approval of the grantors who donated the property for the county seat and jail. Leading the fight to preserve the county’s Civil War Monument is Rhode Island author Mark Dunkleman, who is a descendant of a Civil War soldier — a member of the 154th New York Volunteers, a regiment formed primarily of Cattaraugus County men. Mr. Dunkleman sent an email recently to supporters of the Civil War Monument urging them to contact Public Works Committee members to see if the building could be saved. Mr. Weller said after the meeting that he favored Mr. Teachman’s proposal of expanded parking dedicated to Civil War soldiers on the site. “I like Steve’s idea of an arch, too,” he added. 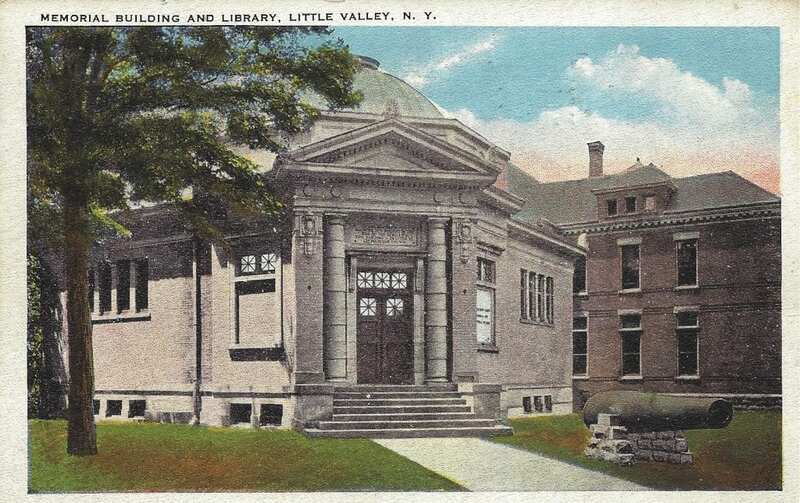 He said any new monument incorporating parts of the current building should be erected at the site in Little Valley, not at the new Cattaraugus County Museum in Machias. The county is paying to heat the building while waiting for a decision to be made after the Public Works Committee agreed last year to put off its demolition, Mr. Weller said. LITTLE VALLEY — Mark Dunkleman was dumbfounded when he learned Thursday that Cattaraugus County lawmakers appeared ready to proceed with demolition of the county’s Civil War Monument in Little Valley. A subcommittee was appointed Wednesday, Sept. 17 to help decide what portions of the red brick building should be saved for a new memorial. Most county legislators did not seem to have a problem with demolishing the structure and expanding the parking lot across from the County Center. Dunkleman, a Civil War author of books on Cattaraugus County’s 154th Hardtack Regiment and a descendant of a Civil War soldier, told the Times Herald he feels he has to continue fighting. The former county museum, the Civil War Memorial, has been vacant for the past 10 years since the museum was moved to Machias. Lawmakers have set aside $175,000 for the demolition. “In national cemeteries from Bath, N.Y., to Gettysburg, Pa., to Fredericksburg, Va., to Andersonville, Ga., and in graveyards throughout Cattaraugus County, the county’s long-gone Civil War veterans must be rolling over in their graves at the news that the county plans to demolish the memorial dedicated to their memory,” Dunkleman said in a statement. “That this decision is being arrived at in the same month that the Cattaraugus County Memorial and Historical Building were dedicated in Little Valley exactly 100 years ago is supremely ironic. At the County Legislature Public Works Committee meeting on Sept. 17, Teachman said the preservationists failed to present a “feasible” plan. He is chairman of a new subcommittee established to help decide what parts of the Civil War monument should be saved and incorporated into a new memorial. Caitlin Meives, a member of the Landmark Society of Western New York, said that after meeting in the spring with county officials where they presented alternatives to demolition, the group has heard little back. An architect, she said, could tell “what it would cost to get it rehabilitated,” but she had no idea of the cost. She said the $175,000 set aside for demolition “could go a long way toward rehabilitation. “We should at least explore the alternatives. That’s all we ever asked for,” she said. There were few follow-up emails that went unanswered, she added. Preservationists hope a New York Senate‑passed bill aimed at preserving war veterans monuments statewide will help convince Cattaraugus County lawmakers to delay demolition of the Civil War Monument and Historical Building across from the County Center in Little Valley. Legislators are looking to salvage parts of the building before it is demolished. LITTLE VALLEY — A bill passed by the New York State Senate that remains bottled up in an Assembly committee could have an impact on the controversy over Cattaraugus County‘s Civil War Monument. Senate Bill S3869, establishing the Veterans Memorial Preservation Act, passed the Senate unanimously in 2013. The Senate had previously passed a similar bill in 2008, but it was referred to the Assembly Veterans Affairs Committee. It suffered the same stagnating fate in the 2013-14 legislative session. The purpose of the bill is to “provide statutory protection for veteran’s memorials throughout New York state.” There are currently no laws protecting veteran’s memorials. Mark Dunkleman of Rhode Island is a Civil War historian and author of books on Cattaraugus County’s 154th Regiment who is trying to preserve the Civil War Monument dedicated in 1914 in what was a park across from the current County Center on Court Street in Little Valley. Mr. Dunkleman found out about the Veterans’ Memorials Preservation Act when he “Googled” the legality of Cattaraugus County tearing down its Civil War Monument, which was the former County Museum. “Within a minute or two, I came across the act,” Mr. Dunkleman wrote in a recent email. “The act passed the NYS Senate without opposition on June 2, with (Sen.) Cathy Young casting an aye vote. It is currently under consideration by the Assembly’s Veterans Affairs Committee,” Mr. Dunkleman said. Mr. Dunkleman said he wonders whether county lawmakers were aware of the Veterans Memorials Preservation Act, and if they are trying to rush its demolition before the act becomes law. County lawmakers have established a $175,000 fund to remove asbestos and demolish the former county museum and adjoining former Board of Elections building. That plan has been on hold since last winter to see if preservationists could help develop a plan to save it. County officials estimated the project would cost $1 million. Last week, the County Legislature’s Public Works Committee named a subcommittee to discuss what items from the Civil War Monument to save for incorporation into a new memorial. Plans currently call for the area to be turned into a parking lot. County Legislator Steven Teachman, R-Olean, chairman of the subcommittee and also a Civil War buff, has proposed building an arch over the entrance to the parking lot. Assemblyman Giglio said he planned to contact the ranking Republican on the veterans panel to discuss why it didn’t get out of the committee, and what could be done next legislative term to get it approved. County Administrator Jack Searles is attending the New York State Association of Counties statewide meeting and could not be reached for comment. LITTLE VALLEY — Cattaraugus County lawmakers are expected to vote next week to proceed with asbestos removal at the county’s Civil War Monument and Historic Building, a prelude to the 100-year-old building’s demolition. Descendants of Civil War soldiers from the 154th Regiment of Cattaraugus County have asked county lawmakers to preserve the building, and the Landmark Society of Western New York has called it historically significant and worth saving. Legislators, however, believe the cost of preserving the building is close to $1 million, an amount the county cannot afford. Legislator Steve Teachman, R-Olean, a Civil War enthusiast and chairman of a subcommittee charged with deciding what parts of the building’s exterior to save for a new monument, said he met recently at the building with a representative from Crandall’s Monuments. Mr. Teachman said many of the parts of the building that should be preserved — perhaps part of a new monument — were not granite, but sandstone. The sandstone has cracks in it has significant erosion of the surface. The columns on each side of the entrance are decorative and would not support weight. Mr. Teachman said a new monument could cost $20,000 or more. An arch over the parking lot entrance, which he envisioned, would cost $50,000 or more. 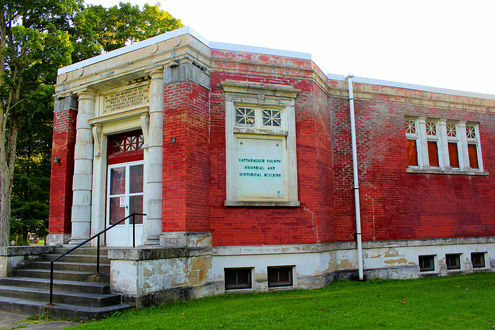 Mr. Teachman said DPW crews could be used to remove parts of the exterior and store them until they could be made part of a new monument or move them to Machias, the site of the new Cattaraugus County Museum. “There are a lot of options,” he said. Legislator Linda Edstrom, R-Olean, also a member of the subcommittee, said she toured the building last week with county Administrator Jack Searles and Legislature Chairman Norman Marsh, R-Little Valley, and said the arched piece of the doorway could be saved, but would have to lay on the ground. They could be used in conjunction with the 1911 cornerstone and the plaque dedicating the memorial to Civil War soldiers. Ms. Edstrom said later the committee never had a formal meeting. Public Works Committee Chairman William Weller, R-Franklinville, said the committee should proceed with a resolution to remove asbestos from the building. “We’re not going to preserve the old structure,” he said. Legislator John Padlo, D-Olean, asked whether there were any parts of the building’s interior that should be preserved before demolition. He suggested those who had sought to preserve the building be contacted to see if there are any parts of the building they wish to save. “Just tell me what you want to save,” said Mark Burr, Public Works director of engineering. On Wednesday, the full Legislature will vote on a resolution seeking immediate consideration to award a bid for asbestos removal that was put on hold last year to give preservationists time to offer options to save the building. “We need to move forward on asbestos abatement,” Mr. Weller insisted. Preservationists mounted an email campaign last month among descendants of soldiers who served in the 154th “Hardtack” Regiment. They later pointed to a State Senate bill that would have required war veterans’ monuments like the Civil War Monument and Historic Building be preserved. The Senate twice passed the bill unanimously, but it was not taken up in the Assembly. Last year, the county Legislature authorized $175,000 for asbestos removal and demolition of the building. Mark Dunkelman, who has been leading efforts to preserve the Cattaraugus County Civil War Monument and Historic Building in Little Valley, is disappointed that county lawmakers appear to have sealed the building’s fate. On Wednesday, the Cattaraugus County Legislature’s Public Works Committee voted unanimously to proceed with asbestos removal at the monument to Civil War veterans on Court Street, across from the Cattaraugus County Center. County legislators have set aside $175,000 to demolish the former museum and adjoining brick building, which up until a year ago housed the county Board of Elections. In an email to the Times Herald from Winchester, Va., where he is speaking about his book “Marching With Sherman” at the North-South Skirmish Fall Nationals Markmanship Competition, Mr. Dunkelman said “ironies abound” in the situation involving the county’s Civil War monument that was dedicated 100 years ago. Mr. Dunkelman, a Civil War author who has written books on Cattaraugus County’s 145th Regiment and is a descendant of a soldier who fought in the 154th’s many battles, was heartened last year when he and other who wanted to preserve the Civil War Monument were successful in delaying its demolition by inundating legislators with emails. “Those pleas led to a temporary halt in the county’s demolition plan but ultimately fell on deaf ears.” Mr. Dunkelman said. Last month, when Mr. Dunkelman learned about a state Senate bill that would require municipalities to preserve war veterans memorials and monuments, he hoped that would derail demolition efforts. The state Assembly has not taken up the bill, so it has not become law. “Professional staff from the LSWNY toured the memorial and found it to be in relatively good shape and an excellent candidate for preservation and reuse and inclusion on the National Register of Historic Places,” Mr. Dunkelman said. The Legislature has not applied for any grants to preserve the structure. “Faced with the widespread protests concerning the demolition, a special county legislative subcommittee has proposed saving “parts” or “pieces” of the memorial to incorporate into a new monument or to be moved to the museum in Machias — their plans currently seem to be uncertain,” Mr. Dunkelman lamented. “Doesn’t an important historic preservation issue deserve due deliberation?” Mr. Dunkelman asked. Mr. Dunkelman asked what the sudden rush was to demolish the building. “The memorial has stood vacant for 10 years now,” he pointed out. Lakewood resident Nancy Barger, a descendant of a Civil War soldier from Cattaraugus County’s 154th Regiment, asks the Cattaraugus County Legislature to table demolition plans for the county’s Civil War Monument and Historical Building in Little Valley. Legislators later voted 11-6 to proceed with asbestos removal prior to demolition of the 100‑year-old building that formerly housed the county museum. LITTLE VALLEY — Despite last-minute pleas by preservationists to delay a vote on removing asbestos from the Cattaraugus County Civil War Monument and Historic Building, lawmakers voted to proceed with its demolition. The Cattaraugus County Legislature, who has received numerous emails from descendants of Civil War soldiers who served in the 154th Regiment to preserve the monument, also heard a plea from Nancy Barger of Lakewood, who asked for a month’s delay in voting for asbestos abatement in the 100-year-old building. Ms. Barger, a former Chautauqua County legislator, said she had received a copy of the deed to the property prior to the meeting and asked for time for the Landmark Society of Western New York to review the deed. A great-grandniece of a Civil War soldier, Ms. Barger held out hope for the possibility of the county selling the building to a group that would preserve it. Ms. Barger pointed to a bill that was approved in the New York State Senate that would prohibit demolition of war veterans monuments as an indication that state lawmakers thought it was a worthy objective. “It would be illegal to tear down a war monument,” she said. State Sen. Catharine M. Young, R-Olean, voted in support of the Senate bill. The Assembly has not voted on the bill, but Assemblyman Joseph Giglio, R-Gowanda, has indicated his support for it, Ms. Barger said. “I don’t think we’ve explored it to the degree we need to to go over and tear this down,” Ms. Barger said. A resolution to table a contract with Wendel Engineering, Surveying and Landscape Architecture of Buffalo for asbestos abatement services for up to $21,000 failed to get enough votes to pass. There are additional costs for air monitoring during demolition. Carl Edwards, R-Limestone, and Paula Stockman, R-South Dayton, sought a one-month delay to give the Landmark Society time to review preservations options. Gary Felton, R-Machias; Dan Hale, R-Portville, Richard Klancer, R-Gowanda, and Vice Chairman James J. Snyder, R-Olean, also supported a one-month delay. Voting against the delay were Steven Teachman, R-Olean; Howard VanRensselaer, R-Randolph; William Weller, R-Franklinville; Linda Edstrom, R-Olean; David Koch, D-Salamanca; Susan Labuhn, D-Salamanca; Richard Lamberson, D-Allegany; Earl McElfresh, R-Olean; Patrick Murphy, R-Cattaraugus; John Padlo, D-Olean, and Chairman Norman Marsh, R-Little Valley. Joseph Snyder, R-Ischua; Minority Leader James Boser, D-Allegany and William Sprague, D-Yorkshire, were absent. It appears that the deed to the property, which contained a reverter clause if the property was no longer used for the county seat and county jail, also contained a release from the original owner, John Manley, Ms. Barger said. County clerk James K. Griffith said there was a “reverter clause” in the original deed if the property were no longer used for county purposes, but that it appeared to have been released in a subsequent deed transfer. County attorney Thomas Brady has said he believed that the deed restriction would require all Mr. Manley’s heirs to sign off on any plans to transfer the property from county ownership. The Landmark Society, which toured the monument earlier this year, had access to the deed, which the county ordered a title search for. “It’s been available in the County Clerk’s Office since 1868,” Mr. Brady said. Ms. Barger said she was unable to find the deed in the County Clerk’s Office on Wednesday, but had been provided a copy by Mr. Brady. County lawmakers have discussed what parts of the building they would like to preserve in a new monument. Those plans are continuing. 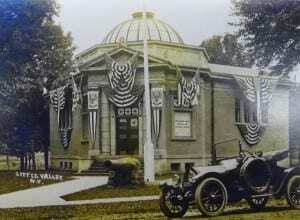 I have been reading about the Cattaraugus County Memorial and Historical Building in Little Valley. Unfortunately, I agree with the legislators that if it would cost $1 million to rehab this building it is not worth saving, but I would like the legislators to look at another side of the story. This building is dedicated to the Civil War veterans who left their homes and families. Many were farmers who worked in their fields to grow crops so the family would have food to make it through the winter months. In their absence, the wives not only had to care for the family, the wives and children had to do the job that the men did. These men felt so strongly for this cause that they volunteered to fight; hundreds volunteered from throughout Cattaraugus County. It is unfortunate that we have become so busy in our own lives that not many people or organizations have been up in arms over this decision to demolish this building. Why haven’t all of the historical societies in Cattaraugus County written to the legislators? I was part of the Salamanca Area Historical Society for 4½ years. This is what we tried to do, preserve local history because once it’s gone, it’s gone forever — hence the loss of the Salamanca Erie Railroad Depot by fire. I know we can’t save every old building in Cattaraugus County, but this isn’t just any old building, this is a building dedicated to veterans. Why haven’t veterans’ organizations, groups and veterans themselves raised their voices? I wonder what would happen if the United States decided to raise and scrap the U.S.S. Arizona from Pearl Harbor? This building was built by the people of Cattaraugus County to show their appreciation for what these veterans did for us. I wonder if the county legislators really know what they have in Little Valley. This isn’t just a monument, but a “whole building.” How many cities, towns or villages can boast that they have a building dedicated to their Civil War veterans? Just imagine how this building would look on the cover of the Cattaraugus County tourism booklet. This building could house information not only on Civil War veterans, but veterans from World Wars I and II, Korea, Vietnam, Grenada, the Persian Gulf, Bosnia, Afghanistan and Iraq. The building could also house historical information about the village of Little Valley. The reunion for descendants of Civil War veterans could also take place in the village of Little Valley, while re-enactments could take place on the museum property. The asbestos probably needs to be removed from the building, whether it is demolished or donated to an organization. I feel this building could compare and possibly be better than the World War II Museum in Eldred, Pa., which is an excellent museum. But just think, the Cattaraugus County Memorial and Historical Museum could be housed in a building that was dedicated to our veterans. The legislators have set aside $125,000 to demolish the building, $20,000 for a new monument and $50,000 for a new arch to be built over the new parking lot entrance. I know the legislators say it would cost $1 million to rehab this building, and maybe it will if every aspect of the job is put out to bid at union payscale. But what if a group of volunteers — carpenters, electricians, plumbers, drywall installers, finishers, painters and tile and carpet layers did the work? Just imagine how far $195,000 could and would go? I know for a fact that it would go very far, because I am the guy who volunteered and remodeled 97 percent of the third floor of the Salamanca Area Historical Museum. I feel strongly that there are enough skilled and interested people in Cattaraugus County who would volunteer to make this dream come true. I also feel that there are enough people in the county who would be interested in volunteering to operate the museum so it could be open from the spring to the late fall season and closed during the winter months to build and set up different displays. Also, I’m sure there are grant writers in the county who could help the museum obtain some needed funding. So if you feel as strongly as I do about saving this memorial, not only in memory of Civil War veterans, but for all veterans, please contact your county legislators and ask them to save it. LITTLE VALLEY — A committee to save the Cattaraugus County Monument and Historical Building has been formed to protect the historic Little Valley building from the wrecker’s ball. 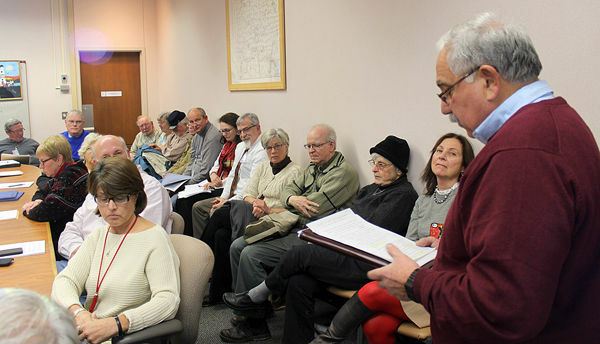 Members of Citizens Advocating Memorial Preservation (CAMP) met recently in Salamanca to devise a strategy to stave off demolition of the building across from the County Center on Court Street. Among the members is Carl Edwards, a county legislator from Limestone. An Allegany man, Thomas Stetz, was named chairman of the group at its organizational meeting. Others attending included Alan Robinson of Salamanca, and three descendants of Cattaraugus County Civil War soldiers, Nancy Bargar of Lakewood, Clark Casler of Jamestown and Cynthia Whited of Spencerport. 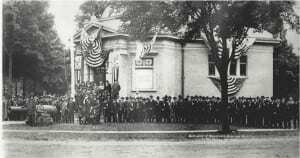 This was the centennial year of the building, constructed as a memorial to the county’s 3,500 Civil War soldiers and sailors. Mr. Stetz invited anyone wishing to join CAMP to contact him at (716) 373-1439. CAMP members hope to convince county lawmakers to give them six months to a year to come up with a plan to save the building, Mr. Edwards said. This would include research for state and federal grants to preserve it, which he doesn’t believe county officials have done. The County Legislature set aside $175,000 last year to remove asbestos and demolish the former Board of Elections building and the adjoining Monument and Historic Building. A committee has been formed to save the Cattaraugus County Memorial and Historical Building on Court Street in Little Valley, which the County Legislature has slated for demolition. Thomas Stetz of Allegany (right), president of Citizens Advocating Monument Preservation speaks to members of the Cattaraugus County Legislature’s Public Works Committee Wednesday, asking for a delay in demolition of the county Civil War Monument and Historic Building in Little Valley. LITTLE VALLEY — Cattaraugus County lawmakers heard a plea Wednesday for a one-year delay in demolishing the County Monument and Historic Building in Little Valley while preservationists seek a clear title and funding to renovate the 100-year-old building. Thomas Stetz of Allegany, a descendant of one of the 3,500 Cattaraugus County residents who fought in the Civil War, and president of the newly-formed Citizens Advocating Monument Preservation (C.A.M.P. ), and other C.A.M.P. members attended the County Legislature’s Public Works Committee to ask the committee to reconsider plans to demolish the monument. Mr. Stetz urged the committee to “find alternatives to demolition,” and offered to help explore those options along with the Western New York Landmark Society. C.A.M.P. feels the upcoming asbestos abatement project at the building at Court and Fourth streets, across from the County Center “should be done with the thought of preserving the memorial instead of demolishing it,” Mr. Stetz said. There is still the question of whether the Monument and Historic Building could be deeded to a non-profit group dedicated to preserving it. Mr. Stetz said the deed restriction is problematic. “It is ironic,” he said, that in the 100th year of the memorial, it is not being celebrated, but is planned for demolition. County Attorney Thomas Brady said, “It is my belief that the deed restriction continues to be valid.” He said a court might have to determine the question. “It’s not just a building,” Mr. Stetz said. “It’s a memorial. Families (of the veterans) are scattered across this great country. This is the only headstone some of the veterans who lie in unmarked graves” will ever know. Mr. Stetz explained the landmark Society of Western New York has agreed to help search for any Chamberlain descendants. Public Works Committee Chairman William Weller, R-Franklinville, thanked the group for expressing their opinion, and that the committee would discuss it in the near future. The County Legislature has budgeted $175,000, including $100,000 in casino revenues, to demolish the building, along with the adjacent brick building that formerly housed the county Board of Elections. Until 10 years ago, the Monument and Historic Building housed the County Museum, but it was moved to the Old Stone Building in Machias the county spent nearly $1 million to restore. LITTLE VALLEY — It appears the group seeking to preserve the Cattaraugus County Memorial and Historic Building has received an early Christmas present. The Cattaraugus County Legislature adjourned for the year Wednesday without taking any action on bids for asbestos abatement at the 100-year-old building. The bids were opened Monday. Citizens Advocating Memorial Preservation (C.A.M.P.) made a presentation at the Dec. 3 meeting of the Public Works Committee, asking for a stay of demolition while they researched preservation efforts. C.A.M.P. President Thomas Stetz of Allegany expressed thanks that the committee had withheld acceptance of the bid for asbestos remediation for now. The Legislature’s Public Works Committee had budgeted $175,000 for asbestos abatement and demolition of the Memorial and Historic Building, which until 10 years ago housed the Cattaraugus County Museum and the adjoining former Cattaraugus County Board of Elections Building on Court Street across from the County Center. The Public Works Department had recommended accepting the low bid of $72,000 from Metro Contracting and Environmental Inc. Niagara Falls, said Public Works Commissioner Joseph Pillittere. Without any action Wednesday by the Public Works Committee to sponsor a resolution for immediate consideration to accept the abatement bid or reject all the bids, the issue will hold over until after next year’s legislative reorganization meeting Jan. 7. Mr. Pillittere said the issue could be put off until legislative committees meet in February. “It’s up to the county Legislature,” he said. However, bids are generally good for only 45 days, Mr. Pillittere said. If the vendor approves, the time period for accepting the bid could be extended. Asbestos abatement is not an automatic green light for demolition of the Memorial and Historic Building. The asbestos would have to be removed before any interior renovations or demolition. Public Works Committee Chairman William Weller, R-Franklinville, said he spoke with committee members about the bids after the opening. Mr. Weller, who is serving his third year on the Legislature and first as chairman of the Public Works Committee, added, “I feel bad it ever got that bad. There was a lack of interest in the building over the years. The 154th New York Regiment was made up of thousands of Cattaraugus County volunteers to the Civil War. The Memorial and Historic Building was dedicated in 1914. C.A.M.P. is seeking title to the building and hopes to restore it with state and federal grants they plan to seek with help of the Landmark Society of Western New York. Cuba resident John Stengel, a Civil War re-enactor, speaks Wednesday at the Cattaraugus County Legislature meeting on preserving the Civil War Memorial and Historic Building in Little Valley. Listening in is Tom Stetz, president of Citizens Advocating Memorial Preservation. LITTLE VALLEY — Citizens Advocating Memorial Preservation (C.A.M.P.) 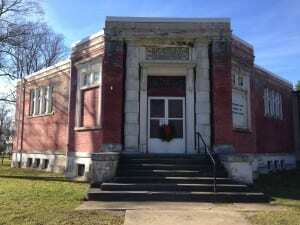 is moving forward with plans to preserve the Civil War Memorial and Historic Building in Little Valley. The group was formed late last year as the Cattaraugus County Legislature endorsed plans to remove asbestos from the 100-year-old memorial, the first step toward its demolition. Group members attended the Legislature’s reorganization meeting Wednesday, updating individual legislators on their efforts to secure grant funding for a feasibility study on preserving the Court Street building, located across from the Cattaraugus County Center. One C.A.M.P. member, John Stengel of Cuba, dressed in a Union Civil War uniform and was offered an opportunity to address the lawmakers. “I’m here as a symbol of the Civil War soldier to express the hope the memorial will be preserved,” he said. C.A.M.P. President Tom Stetz of Allegany said the group submitted a grant application to the Landmark Society of Western New York on Friday to pay for a feasibility condition report by Clinton Brown Company Architecture, Buffalo. The report will include preservation options and recommendations. County lawmakers had set aside $175,000 to demolish the Memorial and Historic Building and the adjoining former Cattaraugus County Board of Elections building. The Landmark Society, which has called the Memorial an historical building worthy of preservation, is expected to have an answer on the grant before the end of the month, Mr. Stetz said. C.A.M.P. received letters of support for the grant from State Sen. Catharine Young of Olean and Assemblyman Joe Giglio of Gowanda, as well as the Buffalo chapter of Sons of Union Veterans of the Civil War, successor organization to the Grand Army of the Republic, Mr. Stetz said. In addition, he said, Mel Duggan, owner of Duggan and Duggan General Contractors of Allegany, has offered to look over the building and give his opinion to the group. C.A.M.P. is also circulating petitions seeking preservation and restoration of the memorial, Mr. Stetz said. The group has about 30 members, many of whom are descendents of Civil War soldiers from the 154th New York Regiment from Cattaraugus County. About 10 members still reside in Cattaraugus County. Mr. Stetz said county lawmakers appear willing to consider transferring ownership of the building, which until 10 years ago served as the Cattaraugus County Museum for many years. He hopes to address members of the Legislature’s Public Works Committee to update them on C.A.M.P.’s efforts when the committee meets Feb. 4. “It sounds like they’re giving us a window of opportunity,” he said. The committee had sought bids for asbestos abatement of the memorial but took no action when bids came in higher than anticipated. Mr. Stetz said C.A.M.P. would like the asbestos abatement done in such a way as to preserve as much of the building as possible. LITTLE VALLEY — The group Citizens Advocating Memorial Preservation (C.A.M.P.) has six months to make progress on preserving the Civil War Monument and Historical Building on Court Street. The Cattaraugus County Legislature agreed Wednesday to a request by C.A.M.P Chairman Thomas Stetz, who asked for a commitment from the county in order to raise funds. The Landmark Society of Western New York has approved a $2,500 grant toward a feasibility study of the 100-year-old memorial dedicated to Civil War soldiers from Cattaraugus County’s 154th Regiment. The group needs to raise an additional $1,000 to pay the $3,500 cost of the study, Stetz said. “C.A.M.P. has received unsolicited monetary contributions and pledges and wishes to actively seek financial support in its efforts to explore options other than demolition of Cattaraugus County’s most significant Civil War memorial,” Stetz wrote. “Cattaraugus County’s formal statement of willingness to cooperatively work with C.A.M.P. would be a helpful addition to C.A.M.P.’s fundraising efforts,” he said. Asked by Public Works Committee Vice Chairman David Koch, D-Salamanca, how much time C.A.M.P. was asking for, Stetz couldn’t provide an answer. “It depends on what the study says,” he explained. The feasibility study is expected to take about six weeks. Legislator Carl Edwards, R-Limestone, asked Public Works Committee members for six months to a year. Legislator Joseph Snyder, R-Ischua, agreed to sponsor a resolution authorizing Legislature Chairman Norman Marsh, R-Little Valley, to sign a letter of support for the group’s efforts. Legislator Linda Edstrom, R-Olean, asked to be a cosponsor, as did Public Works Committee Chairman William Weller, R-Franklinville. “It looks like they are making progress,” Snyder said. Minority Leader Susan Labuhn, D-Salamanca, asked Stetz what the study will include. Stetz replied that it would examine potential uses and include a condition report. “Will it have a price (tag) on it?” asked Marsh. Stetz indicated C.A.M.P. should know more after getting the results of the feasibility study, to be conducted by Clinton Brown Company Architecture of Buffalo. Lawmakers had budgeted up to $175,000 to demolish the former Cattaraugus County Board of Elections Building and attached Civil War Memorial and Historical Building, which until 10 years ago served as the Cattaraugus County Museum. Late last year, the county asked for bids for asbestos removal in the building but never accepted the bid. C.A.M.P. members were concerned that the asbestos removal would cause additional damage to the Civil War Memorial unless it was done with the intent to preserve the memorial. C.A.M.P. planned to meet at the Salamanca Public Library this afternoon to discuss its next moves to save the memorial. County tables support letter for C.A.M.P. LITTLE VALLEY — A resolution to join in a preservation group’s efforts to save Cattaraugus County’s Civil War Monument and Historical Building was tabled by the Legislature’s Public Works Committee on Wednesday. C.A.M.P. President Thomas Stetz of Allegany said the group was seeking assurances that the county would given it time to come up with a plan to preserve the 100-year-old memorial. He said he was uncomfortable raising funds without assurances the building’s demolition would be delayed. Earlier this month, county lawmakers gave the preservation group six months to make progress with an assessment of the building as well as possible future uses. The building has not been used in 10 years. It was last used as the Cattaraugus County Museum. The resolution was sponsored by Olean Republicans Linda Edstrom and Steven Teachman; and Joseph Snyder, R-Ischua; and Carl Edwards, R-Limestone. Legislator William Sprague, D-Yorkshire, led the opposition to the resolution. “My concern is that if we get in bed with them, we might have to put more money into it,” he said. County attorney Thomas Brady said the resolution did not commit the county to anything except writing a letter of support for the group in its fundraising efforts to preserve the building. “It does not bind the Legislature to anything,” he said. At this point, the county cannot deed the building to C.A.M.P. or any other group without permission from the heirs of the family that sold the land to the county, Brady added. “The possibility has not been exhausted,” he said. “We’re going to be perceived as pushing this thing as a Legislature,” Marsh said. Marsh said he had no problem giving the group six months for financing. David Koch, D-Salamanca, asked whether the committee was advocating that it wants to save the building. “I can’t see any (county) use for the building,” he said. The Legislature has budgeted $175,000 for asbestos removal and demolition of the Memorial and Historical Building on Court Street in Little Valley, across from the Cattaraugus County Center. It is connected to the former Cattaraugus County Board of Elections building, which is also slated for demolition. The group has raised the necessary funds to pay for a $4,500 feasibility study by Clinton Brown Company Architecture of Buffalo, Stetz said. The Landmark Society of Western New York has notified the group it will receive a $3,500 grant toward the study. In a Feb. 4 letter to county lawmakers, Stetz asked the county to “formally state in a letter that it is willing to join C.A.M.P. in a cooperative effort to explore the possible options for the continued use of the memorial in a way which will be beneficial” to county residents. Koch said the group wants a feasibility study to see if it is possible to save the building and how much it would cost. “I don’t want to get dragged into something,” he said. Afterward, Stetz told the Times Herald the report should take about six weeks to prepare. While Stetz would have preferred the resolution for a letter of support be approved by the full Legislature on Feb. 25, he noted the Public Works Committee’s minutes included the pledge to give C.A.M.P. six months to make progress. Marsh said he didn’t think the Legislature would close the door if C.A.M.P. were making progress in its efforts. In the meantime, C.A.M.P. is continuing its efforts to join with the Cattaraugus County Region Community Foundation to raise funds toward preservation of the memorial using its 501C3 status for tax deductible donations, Stetz said. The funds will be used to develop a preliminary preservation plan. The work will be performed by Clinton Brown Company, which specializes in renewing historic buildings. A $1,500 grant was also made to the Lyons Main Street Program (LMSP), a designated Main Street program in the Western Erie Canal Alliance (WECA) Main Street Program. Supported by the Town, Village and community, the program is working to preserve and restore the many historic buildings in the core of the Main Street area. Funds will be used to produce a feasibility study and architectural services for a downtown commercial building on Canal Street. The work will be performed by In.Site: Architecture. The Landmark Society of Western New York Preservation Grant Fund provides resources for preliminary design and planning studies to help make positive improvements to at-risk buildings. The Landmark Society’s grant committee considers applications quarterly or as funding is available. Grants are used to help kick-start preservation projects that can have a positive impact on their surrounding communities. Initial funding for the Preservation Grant Fund was made possible by a bequest from Elizabeth (Libby) Stewart. Stewart was a longtime Landmark Society staff member who was dedicated to the revitalization of neighborhoods and historic structures. Donations to The Landmark Society provide ongoing funding. The Landmark Society of Western New York, Inc. is one of the oldest preservation organizations in America, serving nine Western New York counties. Formed in 1937, The Landmark Society continues to protect the unique architectural heritage of our region and promote preservation and planning principles that foster healthy and sustainable communities. For additional information about The Landmark Society, visit www.landmarksociety.org. Photos: Above, the Cattaraugus County Civil War Memorial & Historical Building at the time of its dedication in 1914; and below, the same building today. LITTLE VALLEY — Citizens Advocating Memorial Preservation, the group seeking to preserve the Civil War Memorial and Historic Building in Little Valley, is looking forward to getting access to the building for a structural analysis. More importantly, the feasibility study by Clinton Brown Company Architecture PC of Buffalo will help Citizens Advocating Memorial Preservation (C.A.M.P.) decide what the building could be used for in the future. Tom Stetz of Allegany, chairman of C.A.M.P., said Friday he’s hoping to get a waiver from the county soon so Clinton Brown can go through the interior of the building. “The next step is to get inside the memorial to do the inspection so Clinton Brown can do their report,” Stetz said. The Landmark Society of Western New York last month awarded C.A.M.P. $2,500 to be used toward the $3,500 cost of the study by Clinton Brown. C.A.M.P. has been able to raise the additional $1,000 to cover the study. Formed last year by descendants of Cattaraugus County’s Civil War dead, C.A.M.P. asked county lawmakers to delay the planned demolition of the building, located next to the former Cattaraugus County Board of Elections building on Court Street across from the Cattaraugus County Center. This month, the Legislature’s Public Works Committee gave C.A.M.P. six months to make progress on saving the monument. On Feb. 4, county attorney Thomas Brady said he was working on a “hold harmless” document that C.A.M.P. or Clinton Brown staff would need to sign before being admitted to the building. Stetz said the C.A.M.P. website is up and running, although some sections, like the page for donations, remain under construction. John Scarano of Conewango Valley is the C.A.M.P. webmaster. The site contains news articles about the group’s plans to save the 101-year-old monument as well as historical photos and articles about the 154 Regiment of Civil War soldiers from the county and others. Old photos of the interior as well as exterior photos are also being sought by C.A.M.P. C.A.M.P. is deciding whether to form its own nonprofit 501c3 organization to make donations tax-deductible or go under the wing of the nonprofit group Cattaraugus Community Foundation, Stetz said. In the meantime, anyone wishing to make a donation can express their intent via email to C.A.M.P. at their website: www.cattcomemorial.com. The group is also applying for preservation funding through the National Trust for Historic Preservation and is seeking to have the memorial listed on the 11 Most Endangered Historic Sites. Complicating the preservation efforts is a reversion clause in the deed for the property. Heirs of the family that donated the land to the county may have to sign off on any effort to turn the memorial over to the group to restore it. The dedication hangs on the Cattaraugus County Civil War memorial in Little Valley. The group organizing the effort to save the building has received the support of the Civil War Trust. LITTLE VALLEY — The grassroots organization dedicated to preserving the Civil War Memorial in Little Valley recently received the support of Civil War Trust, a national organization dedicated to preserving American Civil War battlefields. A letter addressed to Thomas Stetz, president of Citizens Advocating Memorial Preservation (C.A.M.P. ), was received this week from Garry Adelman, director of history and education with Civil War Trust. Mark Dunkelman, a Civil War historian who has been an active proponent of C.A.M.P.’s efforts from his home in Rhode Island, noted that because the Civil War Trust is dedicated solely to battlefield preservation, “their support of C.A.M.P. can only be expressed in words, not dollars. “But it’s great to know that the nation’s most influential Civil War battlefield preservation group is on our side in the fight to preserve, restore and reuse the Cattaraugus County Memorial and Historical Building in Little Valley,” he stated in an email. In February, county lawmakers gave C.A.M.P. six months to make progress with an assessment of the building as well as investigate potential future uses. The building has not been used since the Cattaraugus County Museum moved to Machias in 2004. C.A.M.P. currently awaits results of a study being conducted by Buffalo-based Clinton Brown Co. Architecture, which specializes in historic preservation. Officials from the firm were at the site this week to inspect the property. In January, the Landmark Society of Western New York awarded C.A.M.P. a grant for $2,500 to help fund the preservation feasibility study being conducted by Clinton Brown. Staff from the Landmark Society toured the building in November 2013, a month after the Cattaraugus County Legislature had originally voted to demolish it. While waiting for a report from the firm, C.A.M.P. officials are attempting to make plans for Memorial Day, Stetz said. Plans have not yet been finalized, as C.A.M.P. is awaiting permission from the county to host an event at the memorial. Stetz said in email correspondence with county Administrator Jack Searles that C.A.M.P. wished to hold an event in Little Valley, not Machias. Searles said he advised C.A.M.P. to host the event in Machias so activities could be coordinated with the Cattaraugus County Museum there. However, after receiving Stetz’s reply, Searles said county officials are taking the proposal under consideration. C.A.M.P. officials are also working with Little Valley village officials, including the American Legion and VFW there, who organize parade activities, to ensure their plans do not interfere with traditional events already held on Memorial Day, Stetz said. “We’re trying to coordinate anything we do for Memorial Day with all parties involved,” he said. The group has launched a website, cattcomemorial.com, and hopes to soon allow donations to be made online. LITTLE VALLEY — Citizens Advocating Memorial Preservation (C.A.M.P.) met recently for the purpose of continuing the set up of the organization. The group is seeking to preserve the Cattaraugus County Memorial and Historical Building, in Little Valley, which is dedicated to the county’s Civil War soldiers and sailors. Mark Williams Esq., of Olean, was in attendance to advise C.A.M.P. members on steps to take to become a non-profit organization. Since the group has applied for and received a tax identification number, Williams will assist them in the preparation of by-laws, which will provide a formal structure for the organization. Said by-laws will include, but are not limited to, the number of members on the board of directors, how they will be elected and requirements for an annual meeting. C.A.M.P. will presently operate as an informal member-driven organization with the general agreement that the organization will have an interim president and interim secretary/treasurer who will be responsible for the day to day operation of the entity. Members approved a resolution to establish a bank account in the name of C.A.M.P. with two signatories, president and secretary/treasurer. Another resolution was approved to appoint Tom Stetz as interim president and Juanita Ried as interim secretary/treasurer. Both will be authorized to sign any papers necessary. Stetz said, at this point, he wants to keep the organization as simple as possible. In February, the Landmark Society of Western New York awarded C.A.M.P. $2,500 to be used toward the $3,500 cost of the study by the Clinton Brown Company. Since then, C.A.M.P. has been able to raise the additional $1,000 to cover the study. C.A.M.P.’s number one goal is to preserve the 101-year-old memorial. The group has been discussing possibilities for its use in the future that would benefit both the county and the community while honoring all of Cattaraugus County’s Civil War soldiers and sailors. The group has a website that is currently under construction and includes a donation tab, which will be set up to receive donations. 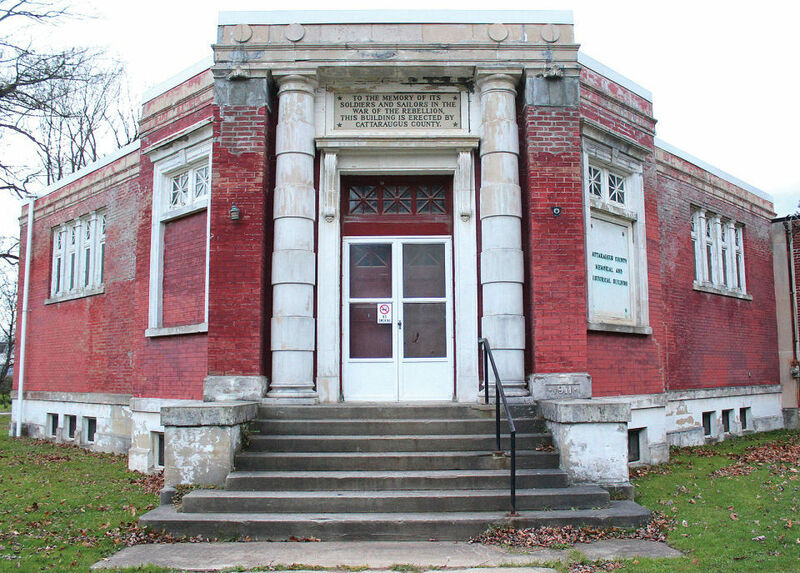 The website includes articles about C.A.M.P.’s plans to save the Cattaraugus County Memorial and Historical Building, as well as historical photos and articles about the Civil War soldiers and sailors from the county. C.A.M.P. is currently seeking old photos of both the original interior and exterior of the building. Stetz has received several letters supporting the Memorial and Historical Building. He received a letter of support from state Sen. Catharine Young, R-C-I-Olean, on March 5 praising C.A.M.P. for its efforts in preserving the historical memorial, in Little Valley. Young thanked C.A.M.P. members for their efforts in pursuing this preservation and restoration venture to honor veterans in Cattaraugus County. C.A.M.P. member Cynthia Whited said the Landmark Society of Western New York is interested in the Memorial Building project. The Civil War Trust, a national non-profit preservation organization dedicated to protecting our nation’s endangered Civil War battlefields, also supports C.A.M.P.’s efforts to preserve, restore and reuse the Memorial Building. Marlynn Olson Ray, former Randolph resident and historian, submitted a letter to the group sharing her reflections on the Memorial Building. She detailed her time actually working in the remarkable and unique structure. Stetz said the group definitely needs more support from local historical societies and Cattaraugus County residents, and he invites active members to join its cause. People interested in honoring their Civil War descendants and supporting C.A.M.P. should visit the group’s website at www.cattcomemorial.com where people can read about the Cattaraugus County Memorial and Historical Building, read news articles about C.A.M.P., post information about their descendants, and post on the blog.